"The martyr Aikaterine was the daughter of a rich and noble prince of Alexandria. She was very beautiful, and being at the same time highly talented, she devoted herself to Greek literature as well as to the study of the languages of all nations, and so she became wise and learned. It happened that the Greeks held a festival in honor of their idols, and seeing the slaughter of animals, she was so greatly moved that she went to the King Maximinus and expostulated with him in these words: 'Why have you left the living God to worship lifeless idols?' But the Emperor caused her to be thrown into prison, and to be punished severely. He then ordered fifty orators to be brought, and bade them to reason with Aikaterine, and confute her, threatening to burn them all if they should fail to overpower her. The orators, however, when they saw themselves vanquished, received baptism, and were burnt forthwith, while she was beheaded." Because of the long gap between the time of her martyrdom and the first written testimony, many scholars and authorities have concluded that St. Katherine never existed, such as the Vatican did in 1969 (though she was restored in 2002). Some have even postulated that her story is an allegory, like many scenes from the lives of various saints, such as the story of St. Christopher (Christ-bearer) who is said to have carried the infant Jesus on his shoulder, or the story of St. George who is said to have slain a dragon to save a princess. Ultimately these things can only be proposed as theories for lack of evidence, but seem likely. Interestingly, the original Greek form of the name Αικατερινη (Aikaterine) or Εκατερινη (Ekaterine) is etymologically very obscure and much argued over. The name does not seem to be rooted in any Greek word, although it has been said to derive from the words αει (aei) which means "ever" and καθαρος (katharos) which means "pure". What we do know is that this name never appears before it is associated with St. Katherine of Alexandria. This is very much like St. Phanourios (the Revealer) who is said to be the patron of finding lost items, and some consider to be merely an epithet for St. George whose life he resembles based on the scenes of his discovered icon in Rhodes. If this is the case, could Katherine merely be an epithet to support the allegory? After all, one of the chief characteristics about St. Katherine was that she dedicated her life to Christ as a virgin, which brought about the late western medieval tradition of her being called the Bride of Christ. One of the more interesting theories is that the story of St. Katherine is based on the life of Hypatia, a neoplatonist philosopher from Alexandria who was admired by both pagans and Christians for her virtue and learning. She also was a woman who dedicated her life to virginity in Alexandria for the sake of her learning, and was brutally murdered in 415 by a group of extremist Christian monks primarily for political reasons. It is not difficult to see the parallels between the lives of St. Katherine and Hypatia, from the little we know of both, but are they in fact the same? In the Middle Ages a tradition began to circulate that Hypatia, through her student Synesius the Bishop of Cyrene, became a Christian. No one knows for sure how this tradition started, but one argument can be made that it did flourish in the city of Laodicea in Asia Minor. Vasilios Myrslides writes in his book Biography of the Greek Philosopher Hypatia (B. Μυρσλίδη, Βιογραφία της φιλοσόφου Ελληνίδος Υπατίας, Athens, 1926; see also Χρ. Μ. Ενισλείδου, Αικατερίνα η αγία και πάνυ ωραία Υπατία, Athens, 1954), that in the village of Denizli of Laodicea there used to be a church "dedicated to the honor and memory of Hypatia, the philosopher and martyr". He further states that this church celebrated its feast on November 25th "for the Virgin-Martyr Saint Katherine in whose name crowds of believers who lived in the surrounding area would celebrate the wise daughter and rhetor Hypatia" (Β. Μυρσλίδη, Βιογραφία και περιοδικό «Κιβωτός» Νοέμβριος και Δεκέμβριος 1953). Myrslides himself was a school teacher in the village of Denizli at the School of the Greek Community in 1897, so his testimony is very reliable. From this information, we see that at least for the Orthodox Christians living in Denizli in the late 19th and early 20th century, Hypatia and Saint Katherine were one and the same person, whose relics are said to rest at the Monastery of Saint Katherine at the foot of Mount Sinai. 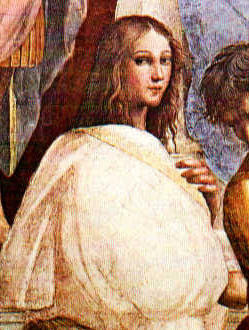 Whether this is indeed the case is very uncertain, so until further evidence comes up, we should assume that St. Katherine and Hypatia were two different persons, and that Alexandria in their lifetimes, having lived a little over a hundred years apart, fostered a great education for women that allowed for two women in particular to come down through history as being known for their great knowledge and wisdom and sacrifice. Perhaps we should merely assume then that Hypatia's memory was held with such great reverence by certain Christians, that her memory became fused with St. Katherine, both of whom were females that lived a life of purity and were held in such high esteem by their peers.